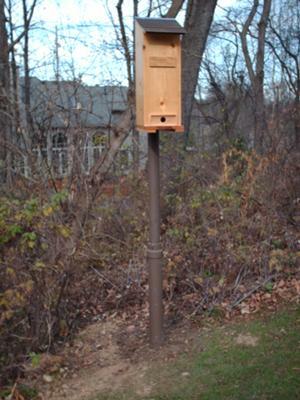 After building this roosting box I installed it in my backyard last November. It stands about 6ft at the entry hole. There has been NO activity in this roosting box. What might be the problem? This comment is for the person who said the hole location should be located higher. 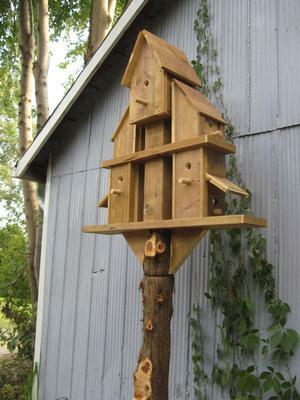 The person who built this has built a ROOSTING BOX not a bird house. 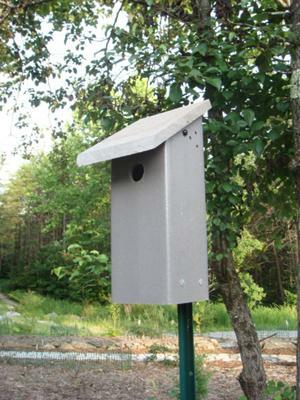 A roosting box purposely has the hole located near the bottom because it is built for multiple birds to have a place to take shelter in & keep warm by sharing body heat during cold winter weather. Notice he stated he put it up in Nov. The hole near the bottom keeps the birds' shared body heat inside the box, rather than having it escape through the hole which it would do if the hole was located near the top. 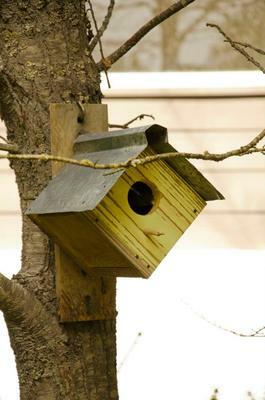 A roosting box also has multiple perches that are offset inside the box so the birds have something to perch on - a nest box does not because the birds use it to build a nest for their young. Different purpose for each & thus the location is different for the entrance hole. Some people build their boxes so the front can be flipped over in the spring, the perches taken out & now the roosting box can become a bird house. To the person who built this....don't despair. Birds sometimes take a while to feel comfortable with something new. 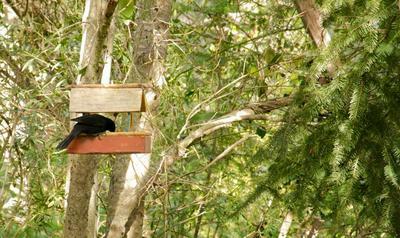 I built the exact same box & mounted mine to the house in Oct. Lots of sparrow activity around it. I have seen 1 little sparrow pop it's head out once but no birds in there steadily yet but I'm sure when the bitter cold comes, it will be used because I've seem them go in to check it out. Just a question. In the picture, it looks like it's mounted where it's wide open. 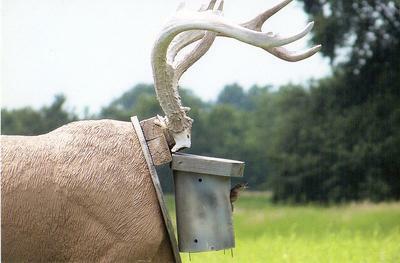 Maybe try mounting it where it is some what sheltered from cold wind & weather. Make sure the hole is not facing into the direction of the wind. "If you build it, they will come". Give it time. 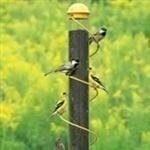 Sometimes even putting up a feeder can take several days or weeks before birds will come & use it. most birds with the exception of a few tend to like the entrance hole 6-8 inches above the inside floor. A bit of aviation history - a copy of the tetrahedon that sat in the center of old airports indicating the direction of the wind hence the "duty" runway for incoming, itinerant pilots. Engineered to rotate into the wind when it exceeds 10 kts. 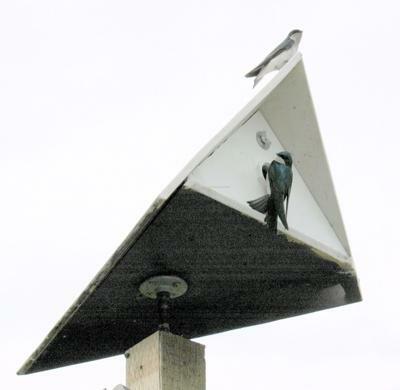 Swallows have been returning on or close to tsx day (15 April) every spring for 20 years chasing away sparrows and other competing tenants before moving in. The beauty of the design puts the entrance in the lee of the storms, tenants remain warm and dry regardless of the strength or direction of the wind. I made these from 3/4" scrap plywood. I cut 6 or 7 apple shapes and cut the center out of 4 of them. Left the back and front whole and drilled a small hole for the opening. I then put the pieces together with a nail gun and wood glue. 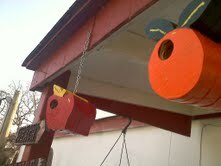 After sanding the outside I painted the birdhouses with non-toxic paint. I left the inside alone so the birds would be in a natural environment. 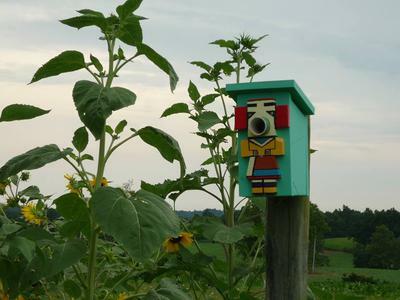 I make state birdhouses, fruit birdhouses, and much more. I had a deck built this year and decided to make something from the leftover pieces. The 4x4 sleeves for the railing posts are the perfect size for a birdhouse. I had several pieces, already cut at an angle from the stair railing. 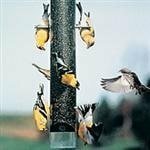 These post covers are 4" x 4" and are the perfect size for a birdhouse. I drilled an entry hole and some air holes for ventilation. I cut a floor from a piece of scrap lumber and nailed that in. The roof is a scrap from the deck fascia board. I glued on two scraps of wood and screwed the roof in place. This will allow me to easily remove it to clean the house. I can't wait for the spring to see if anyone moves in! Just starting to learn about bird houses. I built this house out of barn wood . It has a railroad spike to hold the door shut. I also put a piece off of an old electric pole I found. A clematis vine is growing up the post. This is the life saving station on Sandy hook,N.J. I live in New Jersey on the coast. After the storm there were piles of driftwood everywhere.I collected a lot of usable pieces and started building birdhouses.Spring weather was not very nice so I kept busy making houses out of the driftwood that I collected. 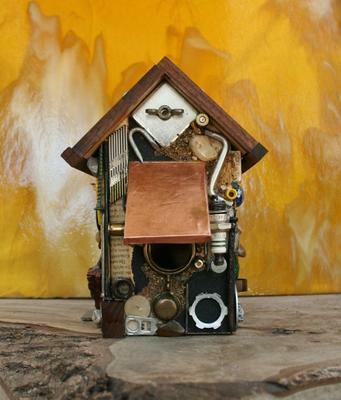 Here is birdhouse inspired from my husbands work shop bench. It is full of all kinds of items the manly man has on his work bench, sand paper, bolts, nuts, even a bottle cap. I added a copper roof and a copper awning to give it a more manly feel. There are two screw eyes on the top so hanging is a breeze. 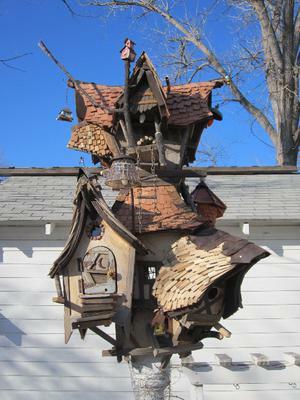 This house is fit for most of the wren sized birds and is fully functional. 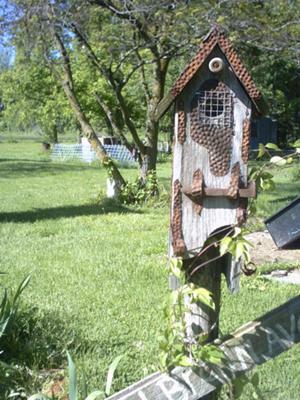 I love making these kinds of house for the birds it adds eye appeal to my yard and gives the neighbors something to talk about, but most important it gives our fine feathered friends a place to raise their young. Sprayed with two coats of non-toxic water proof urethane and has two screws in the bottom for that all so necessary clean up. I have 100 acres of wet-lands in southwest Iowa. 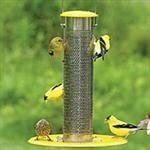 I build bird houses and feeders during the winter and put the new ones out and clean the old ones in the spring. On my way to fill feeders, I spotted a discarded deer decoy in the road ditch. Picked it up to get rid of it in a burn pit. Decided to mount it on a fence and add antlers. The wrens liked the rack for a perch so I added the house. It is in use every year. The most amazing thing is, the fact that it is within thirty yards of a not well traveled dirt road and has only been shot once! 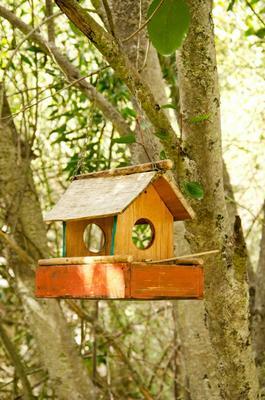 Hi, I am from Neuquen in Patagonia Argentina, in Villa La Angostura we enjoy seeing birds around, I like to build little birdhouses and feeders using reclaimed wood. Our star bird in our yards is the sierra finch, beautiful bird, natural from south america, very friendly and easy to find and attract mostly on summer. Hello from the northwoods of Minnesota, USA. 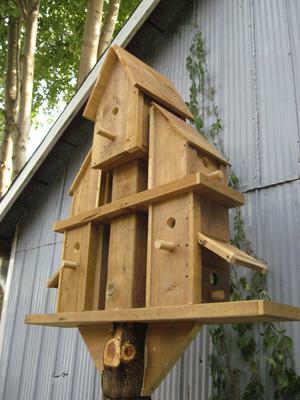 It is great to see ideas using natural materials, reclaimed products to create unique natural bird feeding and nesting projects. It sounds like you really enjoy your birds. I try to build a new project each year for different species and with different materials, mostly from whatever I have around the workshop. Great fun and lasting satisfaction for many years and for all ages. Thank you for sharing. Very nice! And it looks like the birds really enjoy the houses. Good work! Beautiful bird house and a beautiful country. Thank you for sharing your story. 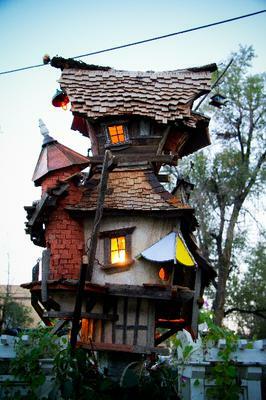 I wanted to build a whimsical looking birdhouse for my garden that I could enjoy from the deck. I wanted it to be a really unique piece with lighting. I had a general idea of what I wanted it to look like, but it soon took on a life of it's own and came out completely different. It was hard to know when to stop! It measures 48" from the base to the top and has 10 lights in it. It looks fantastic at night! All the materials are from recycled sources with the exception of the main frame and light bulbs. It includes redwood from dismantled decks, cedar from old fences, old light fixture parts, used metal and brick and broken tree branches. 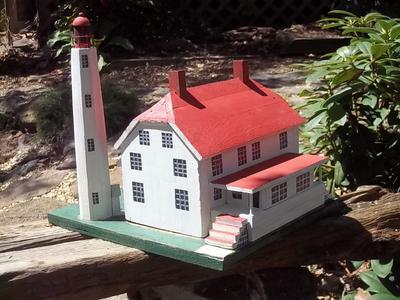 The house was set on an old porch post from California. 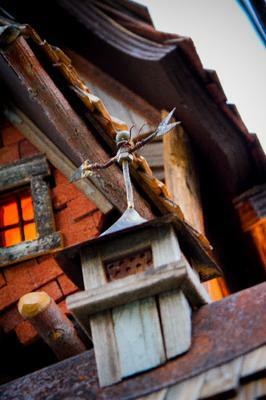 I had so much fun building this house I have gone on to do others which can be seen on my website crookedbirdhouse.com. 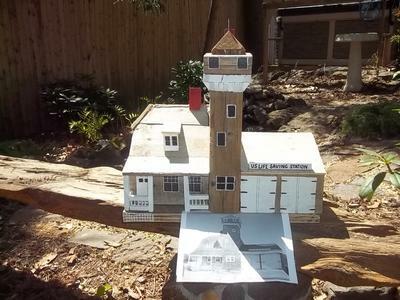 I also built an old Cajun fishing shack that sits in the middle of a pond with a leaky water tower. The birds all love this one and is the favorite watering hole in the neighborhood! They are beautiful and so original. Would love to have some - just could not choose one. Will be in touch. Neat works of art. It was my holiday, not the birds. 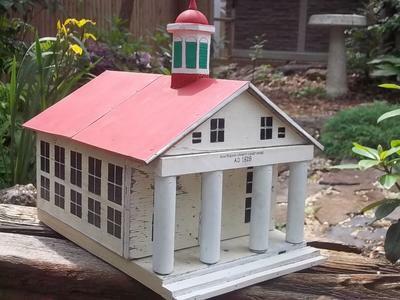 And I already know this is more of a people house than a bird house ...... or to put it another way 'more of a conversation piece, for people.. I cut down a cider bush (leaving the trunk) and built this gathering of bird houses using brown treated lumber (cutting it down to a smaller width ... so fresh cut wood faces inside the box) using 1 1/2 holes for the bird openings. 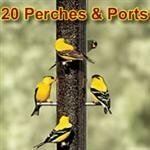 I already know birds of this size don't like to be this close together ... and likely my wood type is a bad choice. So hence .. I call it a people house. Feel free to tell me all the things I did wrong ... if my project end result was to attract birds ... and not just look interesting. Nothing looks wrong to me. It's a great house! To have your own privacy yet close to neighbors! 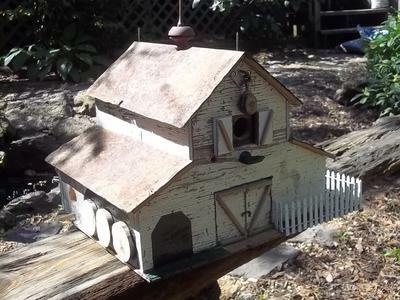 I build a bird house for 6 chickadee’s which sits on a metal bracket on the side of my shed. The back comes off for cleaning. It stands about 5’ with a weathervane and a bird I carved that sit on top. I enjoy every minute building it. I had a vision in my head and I just went with it. Of course my vision turned out to be bigger then I could have every imagined. It took me about 9 fun months to complete in my spare time. 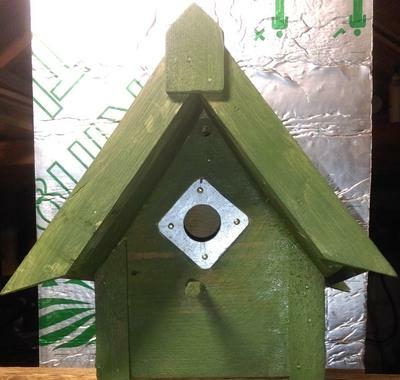 This is a Bluebird house (standard NABS design) built of a single 1"x6"x6' pine board. It has cross-ventilation, drainage and a side-open door for monitoring, cleaning, etc. 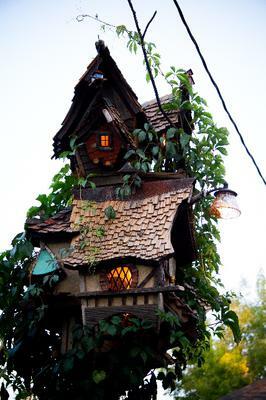 ALL of my homes are built to "spec" and are "healthy" - I detest "cutesy" birdhouses that are deathtraps. I have always used a predator guard for my houses but have found that the HOSP will still invade the house and kill the occupants. After researching, I have found that the HOSP do not like the extension that is made of a 3" length of PVC. 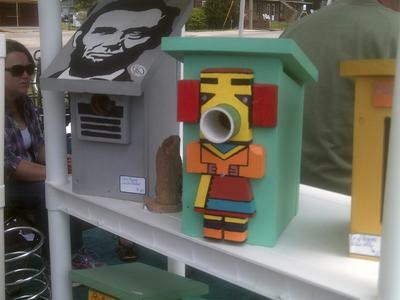 That birdhouse is really cool looking. Awesome work! I added some solid oak flooring scraps that I had leftover from a side job and filled in the front ...drilled a hole in it and a hole on the inside going into the drawer area ...I used a scrap piece of cable tray cover for the roof and reinforced all the boards with galvanized screws. Then I use some old house paint and caulk to seal out the outside and gave it a quick camo paint job. We decided to mount it on top of a black locust tree that have been snapped in a storm about twenty feet off the ground ...this was not easy because after all is said and done it weighed approximately 60 pounds it took three of us to get it up there. I'm looking forward to see what moves in. ..
On new years(01/01/2018) morning my 5 year old granddaughter decided she was going to build a bird house for the Red Robin in the garden, from a card board box. Armed with glue sticks and scissor she set about the task. However, unknown to me the granddaughter had disappeared to my loft workshop and found some bits of old pine floor boards and was about to use a hammer when I saw her, so I suggested that I assist and help her. Together, we used four boards sized 200mm by 200mm by 16mm thick, and for the roof we used 300mm by300mm to provide overhang on all four sides. The roof was covered with an acetate sheet, which in turn was covered with a upper skin of thin slices of treated pine. 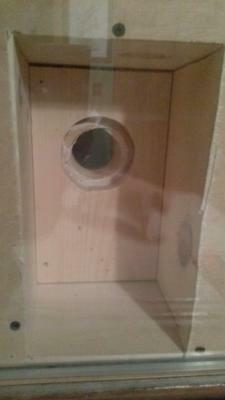 The entrance hole of 28mm diameter for small birds protect with a steel garnishing plate. Having finished the build, Alisha set about painting the wee house. Hoping for the new residents to move in shortly. She may want to embellish it further before We hang in the garden. I really like seeing the metal guard on the entrance. Good job.